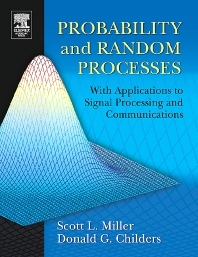 Probability and Random Processes provides a clear presentation of foundational concepts with specific applications to signal processing and communications, clearly the two areas of most interest to students and instructors in this course. It includes unique chapters on narrowband random processes and simulation techniques. It also includes applications in digital communications, information theory, coding theory, image processing, speech analysis, synthesis and recognition, and other fields. The appendices provide a refresher in such areas as linear algebra, set theory, random variables, and more. Exceptional exposition and numerous worked out problems make the book extremely readable and accessible. It is meant for practicing engineers as well as graduate students. Graduate-level courses in the topic with secondary interest to professionals.